Last week’s Hastings & St Leonards Observer carried a long letter from the new owner of the pier, Mr Gulzar. 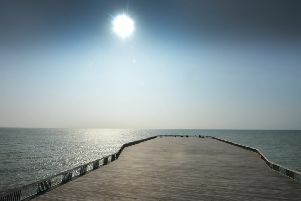 I found it worrying that he said he would keep the council informed of his intentions for the pier ‘when appropriate’. And indeed in the same edition the Observer informed us that a new ice cream hut has opened on the pier, for which Mr Gulzar had not put in a listed building planning application, as should be done. Apparently Hastings Borough Council will receive this retrospectively. Mr Gulzar has a record of retrospective planning applications which, again, I find worrying. Last year Hastings Pier’s stunning design gained it the prestigious Stirling Prize; surely proposed changes and additions to the pier should be presented to the council before, not after, the event.